When Narendra Modi was elected prime minister, he invited his counterparts from all the SAARC countries, including Nawaz Sharif from Pakistan, to his inauguration. There was, accordingly, considerable excitement in Pakistan, especially as Modi’s association with the Gujarat killings of 2002 and his alleged Pakistan-baiting led many Pakistanis to respond to his election with apprehension. Nevertheless, there was scepticism as to whe­ther Pakistan could fit into India’s ‘Neighbourhood First’ policy. Sure enough, the cautious optimism soon gave way to the usual rancorous blame game and mutually exclusive narratives that have alienated the two countries from each other and frozen their relationship in a state of ‘no war, no peace’. Over the decades, there have been short-lived thaws in the relationship. But the ice between the two countries is so deep that nothing less than ‘climate change’ (figuratively and act­ually) can have the energy and momentum to melt it enough to open up a new prospect in the relationship. Facing the real possibility of a shared and calamitous fate might concentrate the minds of decision-makers in both countries. Meanwhile, India’s neighbourhood policy app­ears to have met with a mixed bag of success and setbacks. Afghanistan and Bangladesh appear to be suc­cess stories while Nepal, Sri Lanka, and the Maldives have been relatively problematic. Relations with Pak­­istan remain where they were. The emergence of China in the subcontinent and the Indian Ocean has been a complicating factor for India as it has incre­ased the range of options for its smaller neighbours who, by and large, neighbour India without neighbouring each other. However, India’s rapidly developing strategic and security ties with the US have to some extent alleviated India’s China problem. India’s relations with China are not as frigid, imm­obile and hostile as they have been with Pakistan. Its annual bilateral trade with China is approaching $100 billion, which is several times that of Pakistan’s trade with China, although the CPEC could bring about a dramatic increase. Moreover, China does not wish to push India, nor does India wish to be pushed completely into the arms of the US, whose strategic priorities keep shifting—often quite arbitrarily. China has been keen to associate India with its Belt and Road Initiative (BRI). However, if India is to be a ‘junior partner’ of any superpower, it would prefer the US to China, especially in view of its own great-power ambitions in the so-called Indo-Pacific region. China, moreover, relies on its cooperation with Pakistan—including CPEC—as well as its dev­eloping connectivity-based relations with other SAARC members to counter India’s great power asp­­irations, or heg­emony, in the region. China’s sponsorship of both BRI and CPEC, however, is motivated by broader strategic considerations, esp­ecially the emerging 21st century Great Game or Cold War bet­ween the US and its permanent or contingent allies on the one hand, and China and Russia and their contingent or permanent allies on the other. China-India ties are not immobile— bilateral trade is $100 billion. And India doesn’t want to be pushed into the arms of the US either. In view of this, India’s neighbourhood policy is a work-in-progress. It’s a complicated, uncertain and unpredictable process made dangerous by the ever present prospect of conflict which can escalate disastrously. The state of India-Pakistan relations, the end-game in Afghanistan, and the suc­cess or failure in developing regional cooperation to combat the existential challenges of climate change will determine whether South Asia collapses in chaos or bec­omes a 21st century success story. While opp­­ortunistic posturing and rhetoric will always inform election campaigns, Prime Minister Modi and his political rivals might usefully keep these considerations in mind, especially in view of India’s responsibilities as the major power in South Asia and a possible global power in the future. Pakistan’s Prime Minister Imran Khan is finding his feet as a national leader. But he has made clear he wants a new relationship with India and Afg­hanistan, as well as an improved relationship with the US, because he requires a more stable and friendlier neighbourhood and international env­ironment in which to build a transformed Pakistan—Naya Pakistan. 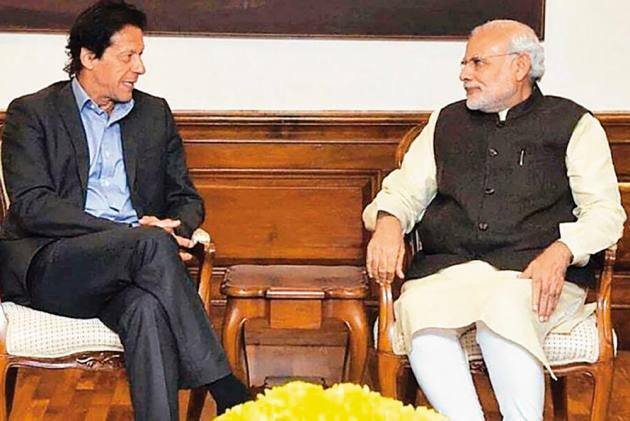 There is, of course, the widespread impression that Imran Khan is beh­olden to and constrained by the Pakistan military/int­elligence establishment which is seen in India to be hostile to any breakthrough in relations in the absence of a Kashmir settlement. The prime minister and the army chief in Pakistan actually do not insist on such strong linkage, although in keeping with Pakistan’s position they do see the stalemate over Kashmir as well as the human rights situation there as stumbling blocks to a normalisation of relations with India. There is also the widely held view in Pakistan that India is not interested in an improvement in relations with Pakistan and seeks only to isolate and weaken it. India, of course, insists that “dialogue and terrorism cannot proceed together” and sees elected heads of government in Pakistan as more or less unable to bring about any lasting improvement in the prevailing situation because civil-military relations are not governed by civilian supremacy. One result of this impasse is the zero-sum game India and Pakistan play with each other in Afghanistan. This constitutes a major imp­ediment in the way of progress towards political compromise and reconciliation, the with­­drawal of foreign troops, and peaceful reconstruction and rehabilitation in Afghanistan after 40 years of devastation. An improved India-Pakistan relationship could significantly contribute to bringing peace to a traumatised people. It could do the same for the people of Jammu and Kashmir if some of the interim understandings reached in previous back-channel conversations can be taken up. Can the Kartarpur initiative initiate something in this regard? The general view is that this cannot happen till after the general elections in India in May 2019. The more ‘expert’ view is that while it is welcome, the Kartarpur initiative itself cannot generate sufficient mom­­­entum and energy to melt the ice. What is required is a willingness of opinion- and decision-makers in both countries to situate India-Pakistan relations in a broader and more urgent context. If this happens, the Indian election campaign need not be a credible rea­­son to delay taking a range of confidence and security bui­­lding measures, including policy statements by the leadership in both countries that do not exclude the respective concerns of each other. The World Bank has reckoned that India-Pakistan trade could quickly reach around $40 billion a year. Imagine the knock-on effects of such a development. Given the seminal changes taking place around the globe and the changing priorities and interests of a younger generation of Indians and Pakistanis, what has hitherto proved to be impossible need not remain so. Well the summary says it all. If the end game depends on Pakistan's friendship with India- It will never happen. Imran is irrelevant, Pakistan Army(the real rulers) will never stop terrorist attacks on India, subversion in China or looting Pakistan. Any Indian attempts at peace are seen as sign of weakness by Pakistani Army and reciprocated with Kargil and similar betrayals. Indians are best assuming there is zero a trust and a permanent betrayal & animosity with Pakistan. Move on, don't waste any time here. Will Sadhvi Pragya Be BJP's Candidate Against Digvijaya Singh From Bhopal?